The judges could not pick just one winner so the decision was made to include two tracks on the remix album! © Amidou Touré. All rights reserved. Used with permission. 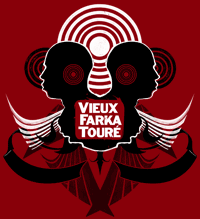 Creative Commons, Modiba Productions and Global Beat Fusion are pleased to present the Vieux Farka Touré / "Ana" Remix Contest. Vieux Farka Touré — a highly talented guitarist, singer, songwriter, and percussionist from Mali — is offering the audio source files from the song “Ana” online under a Creative Commons Attribution-NonCommercial license, so that producers worldwide can use the sounds in remixes and new compositions. The entry period for this contest is over. Thanks to all the participants. Source Materials: Download the separated audio elements of Vieux Farka Touré’s “Ana”. To hear the album version of "Ana," visit Vieux Farka Touré's MySpace page. After all eligible entries have been received, Eric Herman and Jesse Brenner of Modiba Productions and Derek Beres of Global Beat Fusion will be selecting the best remix. The winning remix will be included on Modiba Productions’ “Vieux Remixed” CD compilation. 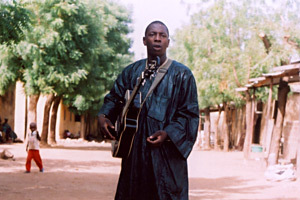 Vieux Farka Touré is the son of the late international superstar and two-time Grammy Award-winner Ali Farka Touré. An historic passing of the torch from father to son is represented by Vieux’s debut. He has crafted a globalminded style all his own with original compositions displaying flourishes of rock and reggae amidst Saharan Blues and traditional Malian melodies. Vieux Farka Touré is ushering in the next generation of Mali blues on his self-titled debut album which features Ali himself on two remarkable pieces. These tracks are the only existing recordings of father and son playing together, and are amongst the final recorded material of Ali before his death. The album also features two magnificent guest performances by the Grammy Award-winning kora master Toumani Diabaté. “Vieux Remixed” takes these beautiful acoustic recording and readies them for the dance floor. Working with the gorgeous strings, able voice and stellar percussion of the original, DJs such as Cheb I Sabbah, Karsh Kale, Nickodemus and Yossi Fine have created rich renditions ready for bass-heavy speakers. Ranging from hypnotic soundscapes to dance floor crushers, “Vieux Remixed” matches the diverse style of the young virtuoso himself. Rounding out the incredible cast of remixers, the album also features Chris Annibell, Eccodek, DJ Center, DK & Cenzo and Fabian Alsultany. Ten percent of proceeds from both albums go towards Bée Sago to fight against malaria in Niafunke, the home region of the Farka Touré family in Northern Mali. Bée Sago, a local award-winning organization, affiliated with UNICEF, specializes in the manufacture and distribution of insecticide-treated mosquito nets to children and pregnant mothers in Mali. Modiba is a music production company and record label committed to the social and economic empowerment of Africa and its Diaspora. They are the creators of ASAP: the Afrobeat Sudan Aid Project, which has raised over $135,000 for the refugees of the crisis in Darfur, Sudan. Jesse Brenner, Modiba Productions: "One of Modiba's central goals as an organization is collaboration, the expansion of boundaries to bring in new ideas and approaches through working together in an open and dynamic way. The Creative Commons project is a perfect example of this, and we look forward to bringing more talented and inspired minds to further explore the sounds of Vieux Farka Touré." Derek Beres, Global Beat Fusion: "Taking Vieux's incredible acoustic material and adding a digital edge is what the future of global music is about. We've been remixing cultures as long as cultures have formed, explored and, inevitably, met one another. Our modern technological capabilities are giving us the opportunity to get to know one another socially, spiritually and sonically. This project will be yet another meeting ground, this time the gorgeous blues of Mali and the rest of the creative world."